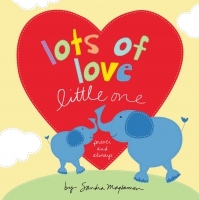 Sandra Magsamen's universal message of love and her adorable illustrations naturally extend the heartfelt message of anticipation and joy for a new child: You're a gift and a blessing in every way. I love you more each and every day! I love you more than all the stars that twinkle at night And all the fireflies that glow so bright. I love you as you sleep at night and play through the days. I'll love you yesterday, today, forever and always. Share the love with your little one with this delightful book from Sandra Magsamen!